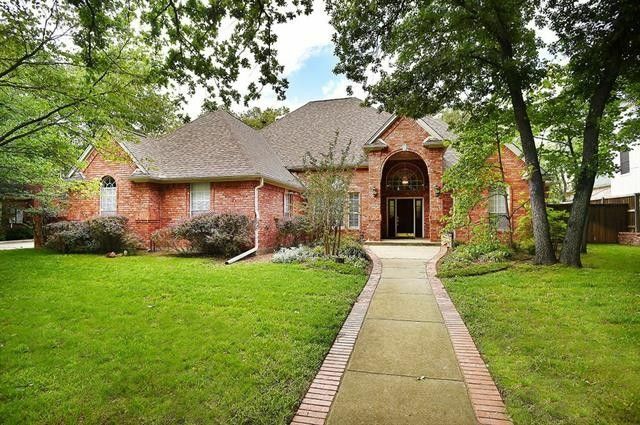 Enjoy comfortable elegance in this one-story Forrestridge beauty on a one-third acre oak-shaded lot! UPDATED with stunning wood floors, granite countertops in all 3 full baths & in kitchen, stainless steel appliances. The secluded master suite has wood floors & a posh updated bathroom with customized large walkin closet, double vanities, jettub & big shower. On other side of the home, 3 private large bedrooms each have walkin closets & share a jack-n-jill bath + another full bath. Open to the kitchen & breakfast room, the family room has a brick fireplace, wood floors & wall of windows to the back yard. The central living room also has a fireplace & wood floors. Chef's kitchen with island & big dining room! Directions: From I-35 E, take the Teasley Lane exit south to Hobson Lane; turn right on Hobson; left onto Forrestridge Drive; right onto Wellington Oaks Circle. Sign in front yard.&#xD;&#xA;&#xD;&#xA;WE HAVE MULTIPLE OFFERS ON 41 WELLINGTON OAKS CIRCLE. PLEASE SUBMIT COMPLETE BEST AND FINAL OFFERS BEFORE 10:00 AM MAY 8, 2017.